In support of the University’s value for Cura Personalis, it is the MU Counseling Center’s mission to promote a holistic approach to the psychological health and development of all students, which contributes to the attainment of their educational objectives at MU as well as responsible community membership. Rooted in a commitment to culturally competent and evidence-based practices, the MUCC addresses the needs of students and consults with faculty and staff in order to enhance the well-being of the Marquette community. The MUCC offers campus delivery of mental health services in the form of individual and group counseling, psychiatric services, and crisis services. The MUCC emphasizes being a visible presence on campus and builds partnerships with the campus community through outreach and consultation services. Finally, the MUCC contributes to the development of mental health professionals through training opportunities for graduate students and post-doctoral residents. In support of the values inherent in Marquette University's Statement on Human Dignity and Diversity, we at the Counseling Center view diversity as including all of the intersecting identities and characteristics that make us unique individuals. We recognize and acknowledge the negative impact of stereotypes, prejudice, discrimination, oppression, power and privilege on student’s mental health. Our commitment to our campus community is to embrace and celebrate diversity in all its richness. We are also committed to the university’s mission of social justice, by which we strive to help all underrepresented groups feel welcome at Marquette and actively work to resolve obstacles to equity. We are invested in creating a community based on mutual respect, understanding and openness. As a staff, we expect that we will support each other in the process of self-exploration around issues of diversity, challenging our own biases and engaging in dialogues for growth. We take responsibility to educate ourselves and others about the mental health issues of a diverse campus community. In our dedication to the creation of a safe space, you can expect us to be welcoming and affirming. We pledge to honor and respect the similarities and differences inherent in our relationship with you, and value this relationship as an important piece of providing culturally competent services. At the Counseling Center, we view this commitment to diversity as an ongoing learning journey, never assuming we have fully reached our destination. Only through valuing and continuing to learn about the diversity that exists in our community and beyond can we truly experience and enjoy all that our world has to offer. Increase visibility for students who may be hesitant to seek counseling. Attend as well as invest time or other resources in programs and student events that center on social justice themes. Keep abreast of and respond accordingly to contemporary events and injustices both locally and globally. Work on committees to revise university policies and support students more fully. Provide training and outreach that addresses and intentionally integrates social justice themes. Offer safety and support to students who feel marginalized on campus and/or elsewhere in society. 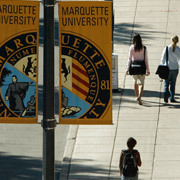 The Counseling Center is dedicated to promoting the psychological health of students at Marquette University. We offer mental health services to be able to respond to the emotional and career exploration needs of undergraduate, graduate and professional college students, and the prevention resources to reinforce healthy development.